You hire a web designer to build you an amazing website. After a few months, nothing seems to be happening. No one is signing up for your newsletter. No one is buying anything. You contact your web designer, and they explain the problem is not your website. You need more visitors. So they refer you to a search engine optimization (SEO) expert. You hire an SEO expert to get your site ranking well in search engines. After a few months pass, there’s still nothing happening. No one is signing up for your newsletter. No one is buying anything. 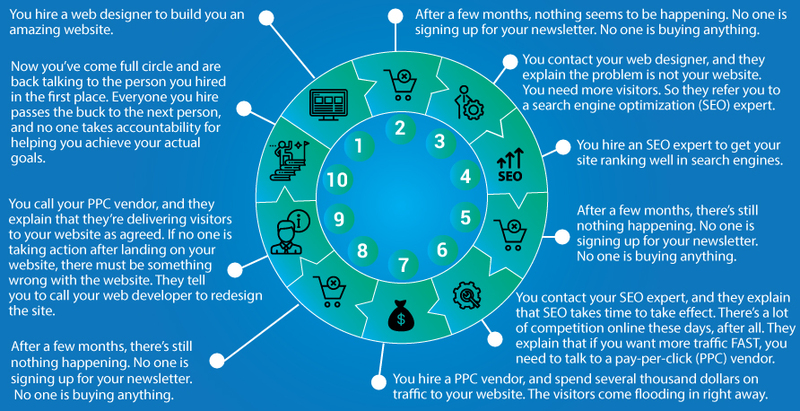 You contact your SEO expert, and they explain that SEO takes time to take effect. There’s a lot of competition online these days, after all. They explain that if you want more traffic FAST, you need to talk to a pay-per-click (PPC) vendor. You hire a PPC vendor, and spend several thousand dollars on traffic to your website. The visitors come flooding in right away. After a few month, there’s still nothing happening. No one is signing up for your newsletter. No one is buying anything. You call your PPC vendor, and they explain that they’re delivering visitors to your website as agreed. If no one is taking action after landing on your website, there must be something wrong with the website. They tell you to call your web developer to redesign the site. Now you’ve come full circle and are back talking to the person you hired in the first place. Everyone you hire passes the buck to the next person, and no one takes accountability for helping you achieve your actual goals. This feedback loop is what we refer to as “The Hamster Wheel of Death”. Unfortunately for most businesses, this cycle is endless. It’s an unending passing of the buck, no one willing or able to take accountability and help you achieve your actual goals. The reason we’ve built DT Business Strategies is to be able to offer you a way out of this loop. At some point, someone has to be willing and able to show you how to get bottom line results you can sink your teeth into. What do we do that’s different? Find out here.